We’re starting 2010 off with a scorcher: a fine example of rural bagpipe music of the Balkans. Preconceived, negative notions about bagpipe music abound, I believe, mainly because the instrument is primarily associated in the mainstream media with British Military processions. This, of course, is a frustratingly narrow view. Not only are there wonderful musicians and folk performances on the Great Highland Bagpipe of Scotland, but the bagpipe itself is a positively ancient folk instrument with varying types and styles stretching from Ireland and the UK, to Spain, across Europe, to Tunisia, and as far east as India. Urban and rural cultures all over the globe have used the instrument to accompany vocalists and dancers since the 12th century, at least. Chaucer famously referenced the pipes in The Canterbury Tales. Bosch, Breughel, and Dürer depicted them in paintings and drawings. For the uninitiated, the bagpipe in its most basic form (which visually seems to reference the human stomach) is comprised of a few simple parts: a blowpipe, the bag (made of animal skin), the melody pipe (known as the chanter), and the drone pipe. Wood and animal skin – and that’s it. These basic ingredients are expanded upon (or not) depending on the culture and geographical location. There are numerous varieties of Italian zampogna with several variations on the numbers of chanters and drone pipes – the Hungarian duda often has a double chanter and one drone. The Tunisian mizwad and the Maltese zaqq have double chanters and no drone pipes. There’s the German dudelsack, the Bahraini jirba, the Cretan askomandoura, the Swedish säckpipa, and hundreds more variations. On Excavated Shellac, we’ve featured music performed on the Galician gaita and the binioù of Brittany. Many thanks to Steven Kozobarich. Also thanks to Ferenc Tobak and Mark Gilston for information on the bagpipes! 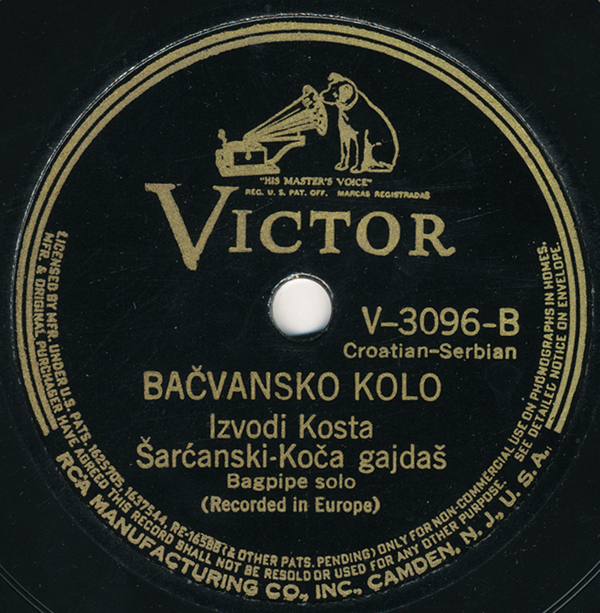 For more of the same, another Kosta Šarćanski performance can be found on the out-of-print Heritage CD The Ace and Deuce of Pipering. “It is a well-attested fact that the bagpipes, when heard by persons who are not accustomed to them, give rise to violent griping pains in the stomach which closely resemble the pains of Asiatic cholera.” – New York Times, April 24, 1885. Very cool. This will fit in very well on my blog for the type of stuff I’m exploring (currently exploring all kinds of music from Serbia.) I will link to your post soon. under the heading “other variations”. I wonder how many chanters and drones he was actually using? So on this recording the gajde have 3 single reeds. On the chanter the second pipe have only one finger hole when it is open it is the same note “do”,like in the melody pipe, when it is covered will do a “so” under the “do”. The drone is two octave lover than that base note “do”. I’m pretty sure this is a Banat gajda from north Serbia. Banat pipes are usually bellows blown and have virtually identical counterparts in Hungary and Romania differing only fundamentally in the color of the bag cover. BTW there are many hundreds of different kinds of bagpipes. France, Spain, Greece, Croatia etc. all have dozens of different varieties still actively being played, and just about every country in Europe has more than five varieties. long live the full-bellied bagpipe! Thanks for posting. This is a great recording. I’m a big fan of Maksim Mudrinic and really enjoy these Eastern European pipes. In regards to the article’s comment on Italian Zampognas, I should mention that within Southern Italy there are multiple varieties of zampogna. Some have no drones at all while some have between 1-3 drones, depending on the region and tradition. Some have equal length chanters, while some are in octaves. Thanks for the details, David – and thank you for checking in. I’ll amend the article. Most importantly, I am glad you enjoy the recording.